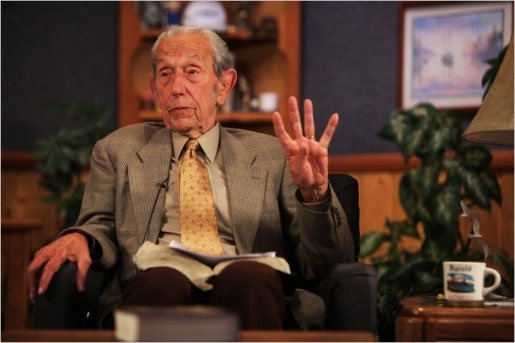 Harold Camping joins Ric Flair's heel stable The Four Horsemen. Well, the May 21 rapture date has come and gone, and as far as I know, everyone’s still on Earth. Well, people who didn’t pass away from natural causes are still on Earth, anyway. Nobody got raptured, and rapture predictor Harold Camping is left with a tremendous amount of egg on his face. That said, Camping is still talking, and according to a recent New York Times article, Harold Camping believes his October 21 prediction of the fiery end of the world is still valid, even if Judgment Day lacked the earthquakes and pyrotechnics he’d hoped for. For his part, Camping says May 21 was an “invisible judgment day” and added that May 21 was a spiritual judgment day, rather than the fire and brimstone and earthquakes regular judgment day Camping foretold. Of course, since Camping is apparently a religious man, he should know that his numerology is all for naught, as the Bible says that only God, not man or Jesus or anyone else, knows when God is going to end the world and Jesus will make his physical comeback.